Pretend I got this up on Saturday for my birthday and not four days late. Thank you. The idea that you shouldn’t care about your age is about as deeply ingrained in our culture as the idea that you should–check out the phrase “age ain’t nothin’ but a number” next to Nicole Kidman getting botox. I think it was my mother’s particular defiance of age-related stereotypes that rubbed off on me most of all. When she turned 50, someone sent her some black balloons, and she called up the flower shop that delivered them and gave them a stern talking to. I can’t claim the idea of the princess/queen dichotomy in American womanhood is entirely something I came up with–I believe it was in one of the books I read before I got married, like One Perfect Day, where the author remarked that it is a very particular fantasy to want to be a princess (a childish position of little responsibility) rather than the queen (an adult position with lots of associated power). Of course, I never wanted to be a princess…but I’ll be queen, sure. Anyway, here’s a picture of me cross thing the finish line at a 20km race on Saturday. I don’t have a picture of myself at 21 doing the same because at 21 my idea of a big day was one where I walked to the library a mile away. Whew. 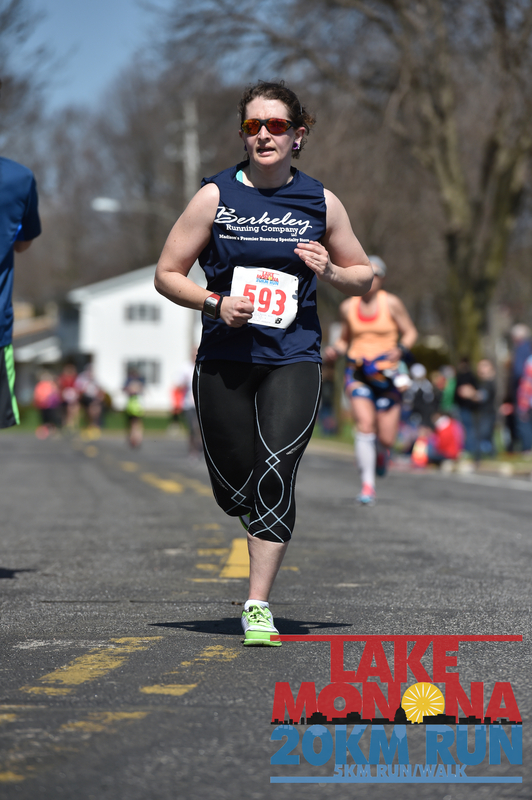 (I’m exaggerating a little, but I wasn’t a runner at the time.) I’ve come a long way since then. 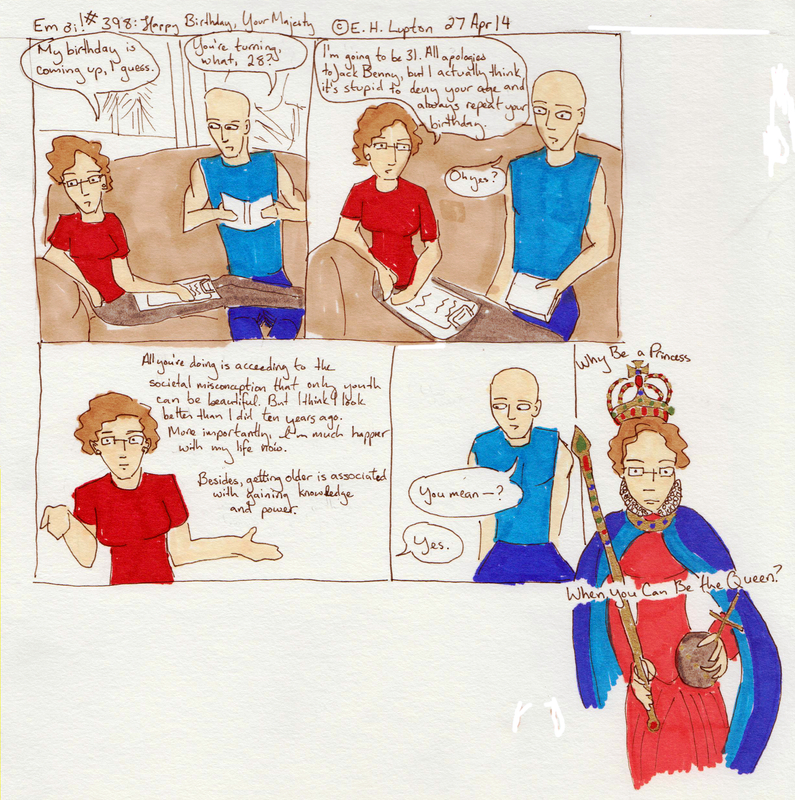 I’ll file the comic under PA3015.B48 L86 2014, for Classical literature–Literary history–Knowledge, treatment, and conception of special subjects, A-Z–Birthdays. Happy Birthday, Emily!! Thank you for your defense of having birthdays and enjoying them, along with the life and times they represent. May you always regard them as gifts in themselves, rather than as burdens, and may they always be happy. And may you always be Queen!! Afterthought: When I reread your essay on birthdays, I realized that the story of how I bawled out the flower shop is a little distorted, and the difference between your version and what actually happened might add some dimension to the discussion. What actually happened was that my sister sent me a planter adorned with fancy mylar balloons, as she sometimes does on my birthday. I think she told the florist that it was my 50th birthday (possibly in an effort to keep them from sending me Christmas decorations, since my birthday is in December). The florist’s assistants added black balloons, rather than the colorful ones she wanted. I knew that my sister would never have ordered black balloons for my birthday. (When I asked her about it, she wailed,”Oh dear!”) It is practically an insult to the birthday person. If you are religious, then it displays the sacrilegious attitude of not being grateful to God for the privilege of having survived to your present age. I told the florists that I was insulted and hurt. Also, since I knew my sister would never have ordered such awful balloons, I told them to give her back her money!